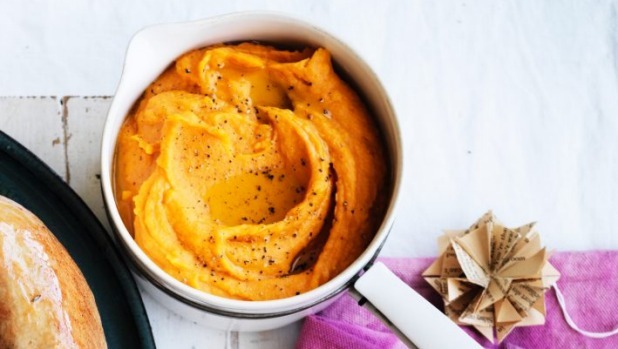 Place sweet potatoes in a saucepan and add enough cold water to almost cover. Add 2 tsp sea salt and simmer gently for 20 minutes, or until potatoes are soft. Set aside. Meanwhile, dice 50g of butter and place in a heavy-based saucepan over a low heat. Add ginger, onion and remaining salt and sauté for about 5 minutes or until onion is very soft. Add sweet potato and cook for a further 2 minutes. Purée mixture in a food processor or blender. Finely dice remaining butter and stir it into purée until melted. Season to taste with pepper. Spoon into a bowl, and serve with my roast turkey.